You’ve likely considered installing bi-fold sliding glass doors in places like your living room or dining room. But what about bedroom sliding glass doors? If you have a beautiful bedroom leading to a balcony, terrace, or outdoor room, you could benefit from frameless glass windows. 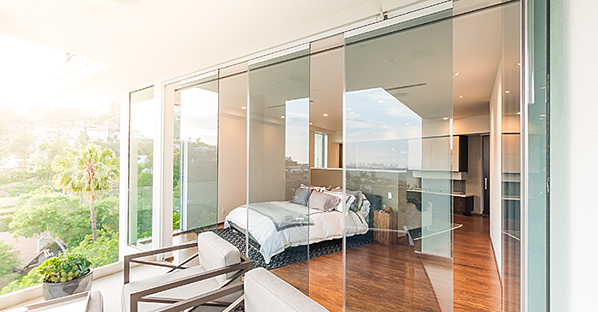 Bedroom bi-fold glass doors allow you to take advantage of stunning views, expand your bedroom, and fill the interior with revitalizing fresh air. Here are a few examples of gorgeous spaces that have already taken advantage of bedroom sliding glass from Cover Glass. 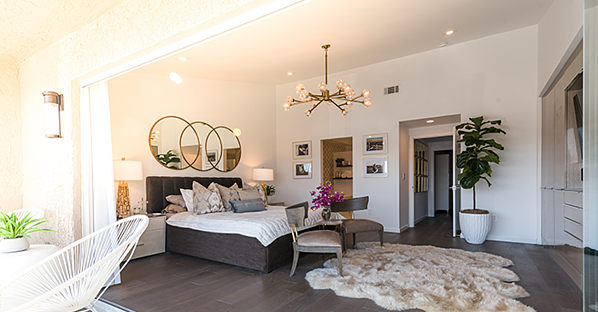 The frameless sliding glass doors open up the entire length of the wall in this bedroom. Leading out to treetops, this room has the feel of a cabin in the woods, which is emphasized by the wood-paneled floor and sloping roof. At the same time, it lacks no luxuries, creating a best-of-both-worlds combination of a rural treehouse and contemporary home. This bedroom features an entire outdoor room just beyond the window. The sliding glass doors take full advantage of this. There is a sense of separation with the distinct flooring and decor, but, at the same time, there is no barrier to move from inside out. This is thanks to the recessed bottom tracks that form flush flooring. With a view like this bedroom, it would be a waste not to have an expanse of window. 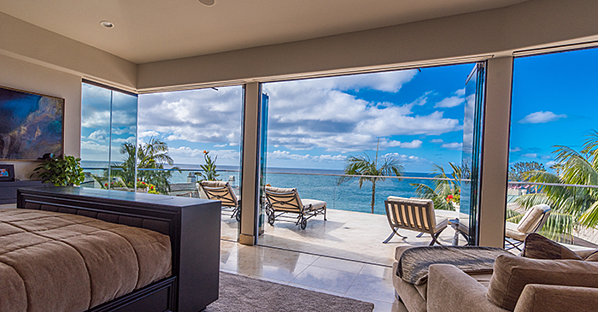 Sliding glass doors are even better, as there is nothing between the room and the waterfront. The owners chose to have the sliding glass system replace the wall up to the ceiling, creating a view that reaches up to the sky. However, they decided not to have the sliding glass door to extend across the entire wall, instead opting for a smaller window beside the bed. This provides a sense of privacy without diminishing the scenery and natural light. 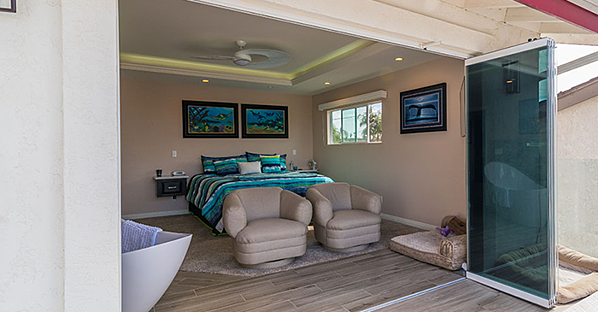 This is another example of how sliding glass doors are an excellent way to connect a bedroom with an outdoor room. In this case, the terrace is purely to enjoy the view — and it has the perfect setup for such a purpose. The sliding doors allow the bedroom to share the uninterrupted views even when the panels are open since the panels stack to the side. In this final example, the outdoor space is an extension of the bedroom. The flooring is the same and decor similar; plus, the seats at the foot of the bed look out onto the outdoor room. However, the glass is tinted instead of clear; this means that when the sliding glass system shuts, there is a sense of a separate space indoors. The glass also adds an ocean tone to the room, matching the color scheme. 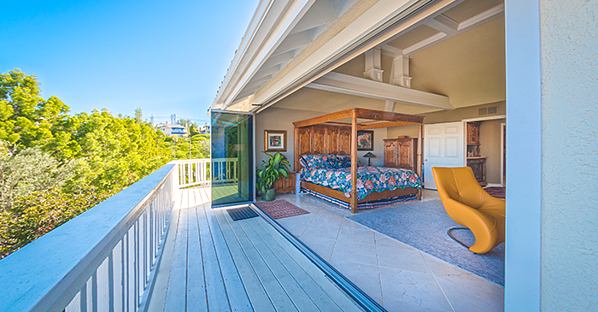 Whether you have a balcony or a full outdoor room beyond your bedroom, you can take advantage of bedroom sliding glass. When you choose Cover Glass, you’ll be able to customize your system regarding glass tint, where the panels stack and track color. Are you ready to install bi-fold glass doors for your bedroom?